For simplicity, I used a single rotary encoder for controlling the attenuation. In order to prevent accidentally changing the set attenuation value, I used the built-in switch of the rotary encoder as the lock/adjust control. The idea is that the attenuation value can only be adjusted when the switch is in the “adjust” state and the attenuation value is set once the switch changes from adjust to the lock state. 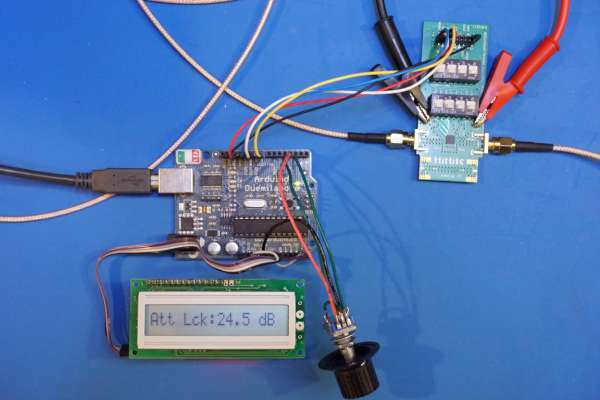 When the switch is in the “locked” state, adjusting the rotary encoder has no effect on the digital attenuator. The current attenuation value is displayed on a 1×16 LCD. For more details, you can find the Arduino code listing towards the end of this post along with a video demonstrating this control interface. This entry was posted on Monday, July 16th, 2018 at 11:34 pm	and is filed under Arduino, Interface. You can follow any responses to this entry through the RSS 2.0 feed. You can skip to the end and leave a response. Pinging is currently not allowed.